After some time in any suppressing system people start to rebel against it. Thinking of Windows as a very white-bread and bourgeois operating system whose tidy, eager and suit wearing citizens live in small row houses and picnic on far reaching meadows, it is only a matter of time before a revolution breaks out. Because revolutions usually start in the shadows, the title of the seminar on Interface-Design was Drop Shadow Revolution. It took place at Merz Akademie at the end of May and basically I wanted to know what the students thought of seeing Windows’ imagery and icons through bourgeois or revolutionary eyes. At the end we came up with Windows 68, an almost finished theme for Windows XP that put the system into a time machine. Instead of “Start” in the lower left corner there was written “Revolution!”, there were red stars everywhere, and the network icon seemed to gain insight into Kommune Eins during its best days and the whole system seemed to be soaking in red paint. 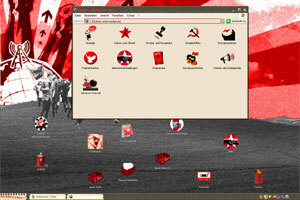 And for the German readers: instead of Benutzerkonten (user accounts) there were Revoluzzerkonten. We also created a new version of Paint that we called Graffiti. It was not possible any more to paint, write, and draw rectangles—only spraying worked. view the project documentation and start a revolution yourself!